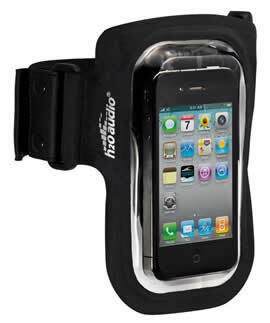 The Amphibx fit waterproof iPhone case armband is the latest waterproof iPhone solution available. It allows you to use most of your iPhone features whilst remaining waterproof. The cleartouch window allows for operation of the iPhone interface. Waterproof headphones (not included) allow you audio access. 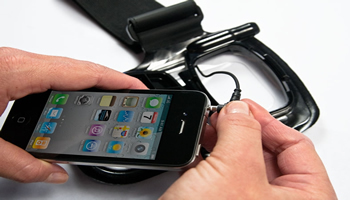 H2O Audio Amphibx fit case provides a comfortable yet secure and wearable watersports solution for a waterproof iPhone. This case sits slightly off the arm with minimal skin contact, allowing for air circulation without compromising fit during activity. 100% Waterproof iPhone Case Solution. A breathable Velcro strap and the StableFit buoy create a comfortable and secure fit in or out of the water. Versatile Adjustable Velcro armband fits most arm sizes. Remove the armband from the sturdy D-rings to throw the case in your pocket or gym bag for protection that can go wherever you do. It Floats! Even with the device inside and armband attached the Amphibx Fit will float. Headphones sold separately.